returns Sunday, October 6th, 2019 @ 1pm! 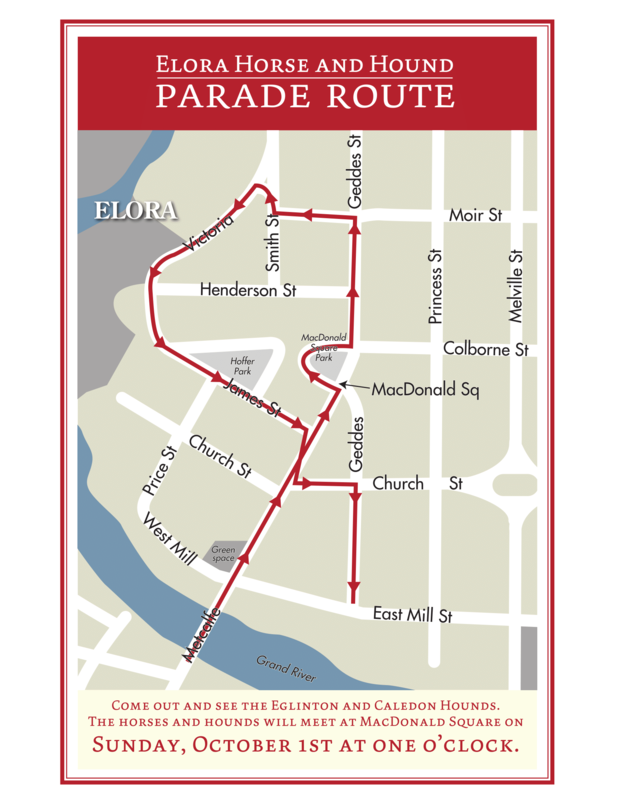 Ontario’s Most Beautiful Village will host the pomp and circumstance of the Eglinton & Caledon Horse and Hound parade, benefiting Groves Memorial Hospital and the Canadian Cancer Society. At about 1:30pm, set against the spectacular autumn scenery of the village. Up to 40 liveried riders and the frolicking hounds depart the park and take to the streets in this non-sporting event, collecting free-will donations as they go. There are amazing photo opportunities along the way. The Elora Horse and Hound parade is actively raising funds to assist Groves Memorial Hospital and more recently the Canadian Cancer Society. Year’s previous (2016) the attendance was estimated to be 5000 people! To date, more than $20,000 has been raised to aid in the cause. We hope for an even larger attendance and an even more generous spirit as the horse and hounds take to the streets again this year. Let your friends and family know about this spectacular autumn event! Rain or shine, the excitement begins at one o’clock in the afternoon. 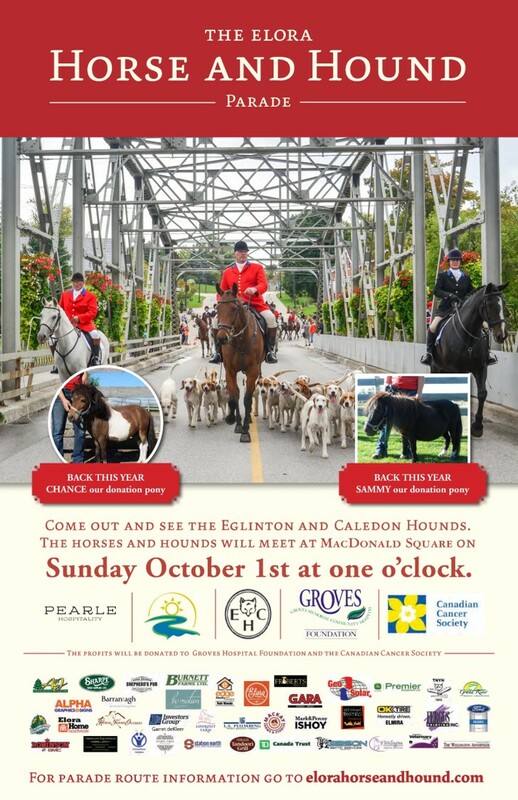 Sunday October 1st, starting at Metcalfe bridge, plan to arrive prior to 1:oo pm. Meet and mingle with the riders, horses and hounds as well as witness the ceremonial cheque presentation to our benefactors. After promenading through the streets, with a photo rest at the Township of Centre Wellington’s Municipal Offices (One MacDonald Square), the parade returns to the Mill Street Bistro at 15 East Mill Street for a Rider’s Reception, where you can mingle with the riders, purchase food and drink, and mingle with some horses and the famous frolicking hounds.